The BEST VALUE and MOST POPULAR water ionizer in the WORLD! The best water ionizer for its price, great performance, reliability and functionality ! 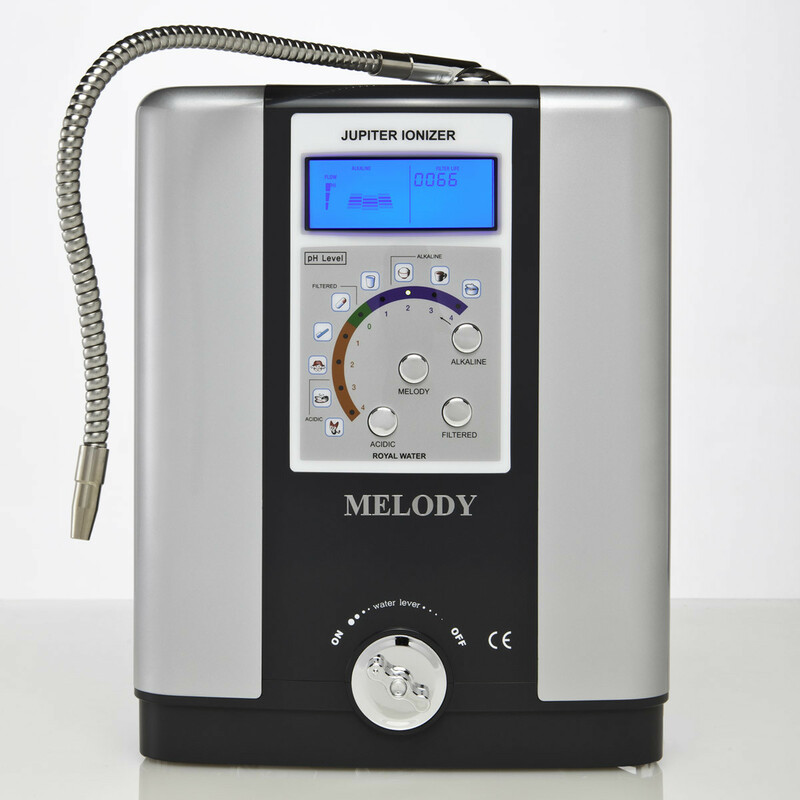 Jupiter Melody JP104 is the best selling water ionizer in the world, due to its reputation gained in and tested in time . It is highly reliable (the first in the world to include patented MARC plate auto-cleanse system added to the platinum-titanium plates (made in JAPAN , life est at 20 years), which, besides providing ionized water even when auto-cleansing , maintains high water ionization performance over time and further enhances water ionizer's lifetime , allowing AlkaViva to be the first company in the U.S. that offered lifetime warranty in the U.S. ). 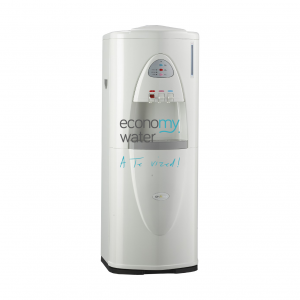 It has great functionality , and produces ionized water with an excellent range of pH and ORP , optimzed for ideal PH alkaline & pure, HEALTHY water . The best water ionizer on the market in its price range(proven superior to models such as Kangen Enagic SD501 water ionizer) and the water ionizer l to purchase , if you can not afford water ionizers such as Delphi IO400 U V or Athena JS 205, but still want a powerful water ionizer, tested and recommended by most people around the globe. 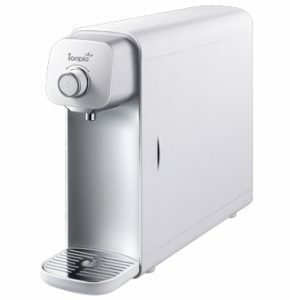 Includes FREE ULTRAWATER filter for exceptional water purification-contaminants removal accuracy of 99.9%. Five advanced SOLID polymer ion platinum-titanium(NO nichel) ,electroplated water ionization plates –made in Japan,20 yrs, estimated lifetime, backed by Emco Tech’s R&D and over 30 years reputation. AlkaViva water ionizers are energy efficient and able to OUTPERFORM much larger water ionizers using the latest micro-technology. Emco Tech has been the supplier of choice for major companies such as Toyo, Hyundai, LG and Samsung since the 1980s plus they manufacturer their own water ionization cells in Japan – unlike many other brands that use cells imported from China etc. Emco Tech could easily make water ionizers with large water ionization plates that require high voltage but they know from research that once you increase voltage towards 200+ watts you will dramatically reduce the life of the water ionization plates (platinum will evetually start to wear off , ionizer will break). This is true no matter how well the water ionization plates are made. That is why Emco Tech has focused on improving efficiency instead of just using more power and more water ionization plates. This is also why Emco Tech/Jupiter water ionizers with only 5 plates will outperform water ionizers that use up to 600 watts and 11 plates AlkaViva Jupiter Melody JP 104 water ionizer & filter features 5-large plate latest technology SOLID polymer ion plated (electroplated) platinum coated titanium water ionizing plates (est. life 20 years, latest Japanese University technology), Why?Some older design water ionizers still use large DIPPED water ionizing plates that use more power that can emit platinum in water, or stainless steel warter ionization plates which were found to emit nickel or even DANGEROUS iridium based(platiridium) water ionization plates. See results when the 5 water ionizing plate AlkaViva Jupiter Melody JP 104 water ionizer is tested with other brands in independent laboratory tests. In making your choice please remember that less power applied in water ionization plates creates less heat and less heat means longer life to all the electronic components inside your water ionizer. The AlkaViva Jupiter Melody JP 104 water ionizer is simply a better performing and easier to use water ionizer than any other competitor’s brand – regardless of water ionizer & purifer /filter price. It was proven in independent EPA laboratory testing to ionize water better than water ionizers such as Kangen Enagic SD501 or Tyent & other top water ionizers that competition offers that use more & bigger water ionization plates that require more power(so they are less durable water ionizers), it’s a more durable water ionizer (thanks to plate design & to the MARC electrode autocleanse system ) & this water ionizer has a LOWER price than other MLM water ionizers NO other brand can boast of such proven reliability or such a solid, consistent range of ionized water pH and ORP. When you turn off the AlkaViva Jupiter Melody JP-104 water ionizer & filter it will go through a water ionization plates cleaning cycle, silently in the background. 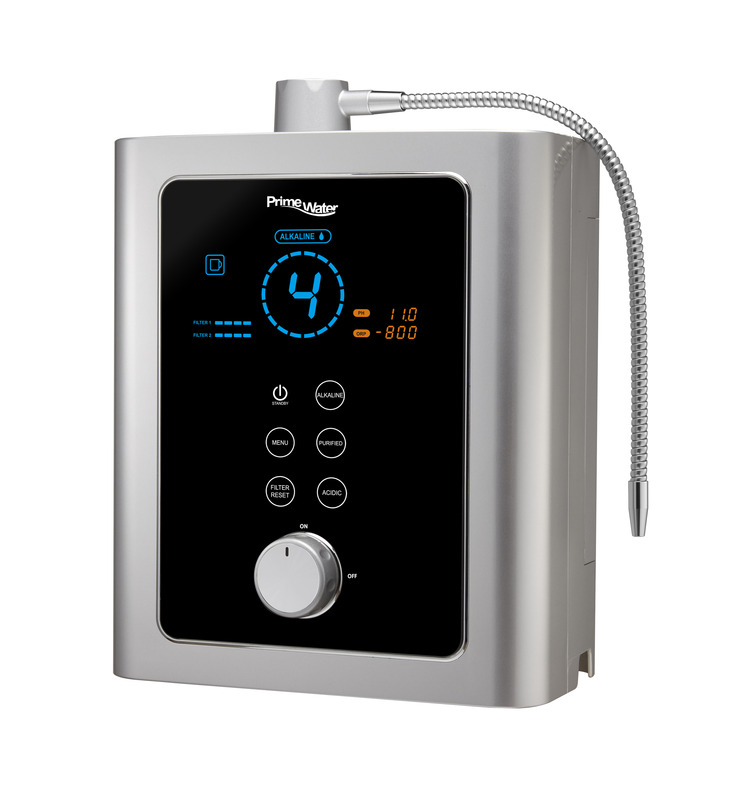 The AlkaViva Jupiter Melody JP 104 water ionizer’s technique of automatic water flow regulation reverses polarity of the electrodes/water ionization plates and changes water flow direction. Thus, alkaline & acid ionized water is available for use ALL THE TIME , even while the AlkaViva Jupiter Melody JP 104 water ionizer & filter is cleaning its water ionization. No more waiting for a drink of alkaline ionized water during a cleaning cycle. The AlkaViva Jupiter Melody JP 104 water ionizer & filter was the first water ionizer in the world to include AlkaViva’s patented MARC system, that keeps the water ionization plates clean (NO scale), thus maintaining high water ionization performance at a constant level over time and extending water ionization plates lifetime. This allowed AlkaViva to be the first company in US to offer LIFETIME WARRANTY for its water ionizers and maintain LOWEST RETURN RATE and LOWEST FAILURE RATE in the industry of water ionizers. 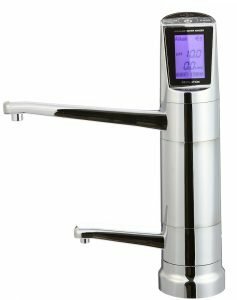 The MICOM control system optimizes ionized water’s pH and ORP and helps keep your AlkaViva Jupiter Melody JP-104 water ionizer & filter in top working condition with the implemented protective features(see below). An error indicator alerts you if service is needed on your AlkaViva Jupiter Melody JP-104 water ionizer & filter . 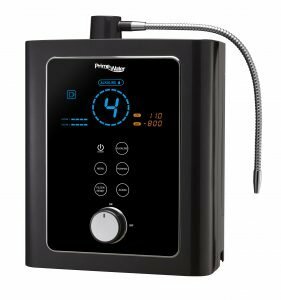 The AlkaViva Jupiter Melody JP 104 water ionizer & filter has an onboard water flow control valve that allows you to fine tune the water ionization performance and gives you true functional control of the water pressure through your water ionizer. 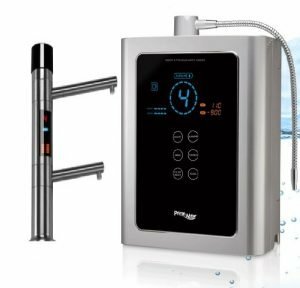 By controlling the water pressure throughput, you can fine tune the ionized water’s pH and ORP ranges to your exact needs and also, you can install the AlkaViva Jupiter Melody JP 104 water ionizer & filter to your main pipe or undersink- see below. This beautiful Liquid Crystal Display has a water flow rate indicator, showing the incoming water pressure by using a “cascading” display. This helps to give you a “visual” of how fast the water is flowing through your AlkaViva Jupiter Melody JP-104 water ionizer & filter and also allows you to beware of low water pressure (though this AlkaViva Jupiter Melody JP-104 water ionizer & filter also has a low water pressure auto – protection). This allows you to add extra calcium(alkaline mineral) to your AlkaViva Jupiter Melody JP104 water ionizer & filter, or to use the Scale Guard Inserts (to help reduce internal water ionization plates scaling pre-electrolysis). It is important to note that the AlkaViva Jupiter Melody JP 104 water ionizer & filter is a very strong water ionizing & filter unit and will NOT require the use of extra calcium in most areas . Some areas, however, have soft water or water that is low in naturally occurring calcium and other dissolved minerals. This feature is intended to boost water ionization performance in those areas when necessary. Too slow of a water flow can damage any water ionizer. Emco Tech has built into the LCD panel an indicator that will show you when your incoming water pressure going into your AlkaViva Jupiter Melody JP-104 water ionizer & filter is too low to operate it safely. This feature safeguards the water ionization cell and protects your investment. The AlkaViva Jupiter Melody JP 104 water ionizer & filter employs a thermal switch in the water ionization cell to shut down the water ionization process if the temperature in the water ionization cell gets too hot. This small but valuable feature saves you from a lot of potential trouble. The AlkaViva Jupiter Melody JP 104 water ionizer & filter has a glass tube fuse that will protect the expensive circuitry in case of power fluctuations or surge. Hot water can damage your water filters. This LCD alarm will illuminate when you accidentally put hot water into your AlkaViva Jupiter Melody JP 104 water ionizer & filter to safe guard it, and your water filters, against damage. This feature audibly tells you what type of water you’ve selected each time you use the AlkaViva Jupiter Melody JP-104 water ionizer & filter. This feature is fully adjustable allowing you to turn the volume up, down, or completely off. The AlkaViva Jupiter Melody JP 104 water ionizer & filter has LED indicator lights which will let you know what level of water ionization you have selected. It also has icons that display the most typical use for a given setting. The AlkaViva Jupiter Melody JP 104 water ionizer & filter offers you a way to track the water filter life of its internal water filter, with a 4-digit numeric indicator that goes from 0000 (when the water filter is new) to 9999 (when the water filter is exhausted). All new AlkaViva water ionizers(including AlkaViva Jupiter Melody JP 104 water ionizer & filter) now include an EXTRA, FREE UltraWater filter that provides the best internal water filtration ever created for water ionizers. With your new AlkaViva Jupiter Melody JP 104 water ionizer & filter you get for FREE the new UltraWater filter, as well as the standard Biostone ionized water filter that will come pre-installed in the AlkaViva Jupiter Melody JP 104 water ionizer. The UltraWater filter will eliminate almost ALL known water contaminants with an amazing 99.9% removal rate, giving you the PUREST, HEALTHIEST mineral water . You can easily replace the factory water filter in the water ionizer with the new UltraWater filter, and keep the factory water filter as a backup . For those with well-water(untreated & unchlorinated water), you can also purchase the .01M Biostone Hollow ionized water filter to remove particulates, sediment, bacteria, parasites, cysts, etc to an amazing 1/100th of a micron water filtration precision. The AlkaViva Jupiter Melody JP-104 water ionizer& filter can use all of the latest water filtering technology offered by AlkaViva, and all future water filters. At your sink with a diverter from the tap (on the wall or on the counter). At your sink plumbed directly to your cold water line. 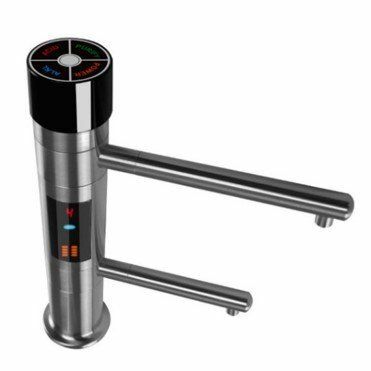 There is no need for diverter valve, and you can operate the AlkaViva Jupiter Melody JP-104 water ionizer & filter while washing dishes from your regular sink faucet. Comes with everything you’ll need to perform a standard installation for AlkaViva Jupiter Melody JP 104 water ionizer & filter . Unique or custom installations may require extra parts and or adapters. The AlkaViva Jupiter Melody JP-104 water ionizer & filter comes with test tubes, PH reagent liquid and a pH color chart to help you understand the water ionizer’s performance, and so that you can be sure you are drinking the right level of pH , healthy alkaline ionized water. Bottom Line: The AlkaViva Jupiter Melody JP-104 water ionizer& filter is by far the MOST POPULAR retail water ionizer WORLDWIDE. The AlkaViva Jupiter Melody JP-104 water ionizer & filter has been around before 1986 and it is the most popular, well known & sold water ionizer in the world. The first water ionizer – filter system in the world to include AkaViva’s patented MARC system that , besides providing ionized water even when cleaning, keeps the water ionization plates clean, thus maintaining high water ionization performance at a constant level, and extending water ionization plates lifetime . MARC allowed AlkaViva to be the first company in US to offer LIFETIME WARRANTY for water ionizers & maintain the LOWEST FAILURE and RETURN RATES in water ionizers industry.. Very user friendly, proven reliability & durability. Preferred and reccomended by experts such as Dr. Robert O. Young PhD, Dr. Ted Baroody, Sang Whang State of the art electronics and patented polymer ion separation technology. AlkaViva Jupiter Melody JP-104 water ionizer & filter is extremely reliable, has great functionality & water ionization performance, and produces ionized water with a great range of pH & ORP. It was proven in independent EPA laboratory testing to ionize water better than water ionizers such as Kangen Enagic SD501 or Tyent & other top water ionizers that competition offers that use more & bigger water ionization plates that require more power(so they are less durable water ionizers), it’s a more durable water ionizer (thanks to plate design & to the MARC electrode autocleanse system ) & this water ionizer & purifer/ filter has a LOWER price than other MLM water ionizers If you are shopping for the BEST VALUE HIGH-END water ionizer available then the Melody JP104 water ionizer & filter is for you. This water ionizer & filter sells for over $US 2,000 in Japan. Enjoy the exceptional water filtering capacity, constant alkaline water even when cleaning and, most of all, TOP water ionization performance & DURABILITY due to the MARC system Uses the most advanced patented output technology, fully featured LED display and micro-technology. Can be connected to faucet or directly plumbed. High quality finish upgraded in 2007. The AlkaViva Jupiter Melody JP-104 water ionizer is simply excellent in all ways and we believe it is the best value water ionizer available, regardless of higher prices charged for inferior water ionizers elsewhere. Now includes for FREE, an EXTRA ULTRAWATER filter for the CLEANEST, HEALTHIEST water(99.9 % removal of ALL known water contaminants). Also able to be installed as an undersink water ionizer model with the purchase of a conversion kit. Through revolutionary AlkaViva Jupiter Melody JP-104 water ionizer & filter you get the very best value and MOST popular water ionizer in the WORLD! The AlkaViva Jupiter Melody JP-104 water ionizer & filter is the proven leader in water ionization performance results in independent EPA certified testing, coming in second only behind the Jupiter Science Athena JS-205 water ionizer . Emco Tech has been the supplier of choice for major companies such as Toyo, Hyundai, LG and Samsung since the 1980s plus they manufacturer their own water ionization cells in Japan – unlike many other brands that use ionized water cells imported from China etc. Emco Tech could easily make water ionizers with large water ionization plates that require high voltage applied on water ionization plates but they know from research that once you increase voltage towards 200+ watts you will dramatically reduce the life of the water ionization plates(platinum start to wear off, etc). This is true no matter how well the plates are made. That is why Emco Tech(Jupiter Science ) has focused on improving efficiency instead of just using more power and more water ionization plates. The AlkaViva Jupiter Melody JP 104 water ionizer is simply a better performing and easier to use water ionizer than any other competitor’s brand – regardless of water ionizer- purifier/filter price. It was proven in independent EPA laboratory testing to ionize water better than water ionizers such as Kangen Enagic SD501 or Tyent & other top water ionizers that competition offers that use more & bigger water ionization plates that require more power(so they are less durable water ionizers), it’s a more durable water ionizer (thanks to plate design & to the MARC electrode autocleanse system ) & thsi water ionizer & purifer /filter has a LOWER price than othe MLM water ionizers. NO other brand can boast of such proven reliability or such a solid, consistent range of ionized water pH and ORP. AlkaViva Jupiter Melody JP 104 water ionizer, was the first water ionizer in the world that always gives alkaline water even when cleaning the water ionization plates– you never have to wait for your ionized or filtered water . Other brands of water ionizers & filters still either stop making alkaline ionized water when in clean mode or do not provide regular automatic cleaning. ONLY the AlkaViva Jupiter Melody JP 104 water ionizer & filter includes the patented MARC system that cleans in the background so that you never have to wait for fresh, clean ionized water. With ALL the competing brands you have to wait while they clean. Plus ONLY AlkaViva water ionizers clean water ionization plates with every use so that NO scale is built up on them: water ionization plate lifetime is further extended & high water ionization performance is maintained constant over time . NO other brand of ater ionizers , filters, purrifiers offers the technology to keep the water ionization plates free from calcium buildup year after year or a cleaning system that works invisibly in the background (meaning you never have to wait while your water ionizer cleans). Most important – because the plates are cleaned with every use they remain clean. Ask our sales department about how AlkaViva water ionizers keep producing alkaline ionized water with high -ORP, while other brands soon start to fail due to mineral buildup. This allowed AlkaViva to be the first in US to offer LIFETIME WARRANTY for our water ionizers PLUS FREE shipping if any repairs were ever needed. Why invest a lot of money in an water ionizer that will often in months drop in water ionization performance due to mineral buildup? NOW, ALL AlkaViva water ionizers( including the AlkaViva Jupiter Melody JP 104 water ionizer & filter) include for FREE UltraWater filter – for 99.9% removal off ALL known water contaminants(NO nitrates, No fluoride, NO chlorine, etc) ~ Why?The UltraWater filter means that not only is your water filtered of impurities to the very finest possible degree, but it is also preconditioned by reduction of water surface tension for maximum negative ion production(MAX antioxidants) during water ionization. There is no substitute for a quality, replaceable ionized water filter. The new amazing UltraWater filter means maximum purity, energization and water filtration ability. AlkaViva is the ONLY water ionizer company to have their water filters manufactured in the USA to NFA standards. Plus the new UltraWater filter (that comes standard with every AlkaViva Jupiter Melody JP 104 water ionizer) removes 99.9% of almost ALL water contaminants. As most people buy water ionizers for health reasons, pure & healthy water (water purification from contaminants but NOT from healthy minerals) should be one of the main aspects you should look for. Why buy a water ionizer that does not properly clean your water ? Just ionized(i.e. : alkaline) water(with contaminants) is NOT healthy water. Pure AND ionized water IS. 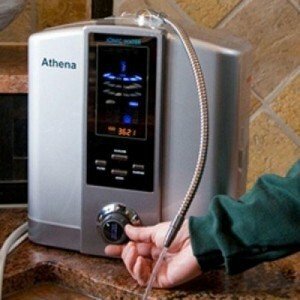 And you can choose to attach your AlkaViva Jupiter Melody JP 104 water ionizer & filter on your wall,. either to your tap or directly to the water line below your counter or install under the counter by purchasing one of our patented dual-outlet, above-counter faucets. 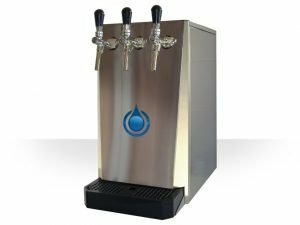 NO other above-counter water ionizer also offers a patented undersink water ionizer installation (with a range of faucet colors) and the choice to simply connect to your faucet or directly through the counter to your cold water line. No wonder the AlkaViva Jupiter Melody JP 104 water ionizer & filter is sold by more dealers in the USA and worldwide than any other model of water ionizers. 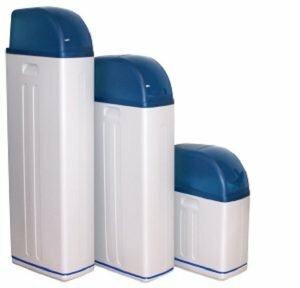 Feature for feature, this system has been the undisputed “KING” of water purifying/filtering & ionizing systems for over two years. MARC background water ionization plate auto-cleaning patented system – Unique post-operation automatic, silent cleansing for extended lifespan ~ Why? Every water ionizer in the world worth investing in has an inbuilt cleansing routine. This ensures that any particles that may find their way past the water filter are not ‘caught’ in the water ionizing cells. The method is simple – the magnetic field in the water ionization chamber is reversed so that any mineral that has energetically adhered to a Titanium plate is repelled and flushed away. It’s a clever system & assures the user of a long, trouble free life; but it isn’t perfect – except with the AlkaViva Jupiter Melody JP 104 water ionizer & filter and other AlkaViva water ionizers. Before, during the cleaning cycle, the water flow was changed from alkaline to acid. Now for the first time ever, the AlkaViva Jupiter Melody JP 104 water ionizer & filter delivers only alkaline water from the alkaline sprout. 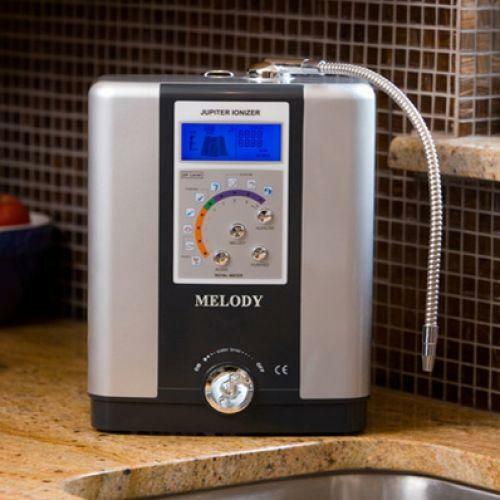 No more waiting even when your AlkaViva Jupiter Melody JP 104 water ionizer is cleaning! ionized water with solid, consistent range of pH and ionization. Research shows that the ideal level for drinking ionized alkaline water is between pH 8.5 – 9.5pH with an ORP of -250mv. It is unimportant if an water ionizer creates big -ORP numbers at really high levels of pH.Water over a 10pH begins to acquire an unpleasant taste due to the heavy concentration of minerals. What is important, is drinking ionized alkaline water at the ideal alkaline levels of pH 8.5 – 9.5pH with a good consistent -ORP. The AlkaViva Jupiter Melody JP 104 water ionizer & filter can achieve some pretty high and low pH and ORP levels of ionized water , but it is designed to give you the best ORP at the lower levels of alkaline pH of ionized water. The alkaline ionized levels that you will actually enjoy drinking, and will be the most healthy and beneficial. Four levels of alkaline ionized water ~ Why? Extra levels of pH means greater choice for you and other users. It also allows you to take advantage of higher ionized water alkaline pH levels when cooking which make greens greener, rice fluffier and coffee and tea more flavorful.Water ionizers usually have at least 3 levels of intensity to choose from. This is mainly because pure & alkaline ionized water is extremely detoxifying; people who have toxins built up in their system can suffer reactions such as headaches or diarrhea. This is especially true of the elderly because they often have built up many toxins in their bodies over the years. Also those who have a very poor diet(toxic , processed, refined foods , acidic – i.e. sugar, rafined cereals, “veggies” with pesticides, chemicals, animal products grown with hormones, injected ,etc- tipical diet) or have taken a lot of medications over the years. Having different levels of pH available simply allows people to build their tolerance for alkaline ionized water more slowly if they wish. Four levels of acid ionized water ~ Why?Enjoy the many ways you can use acid ionized water; for your skin, for your plants, for your home hygiene and more.The skin is naturally an acidic organ. People who regularly use acidic ionized water to wash their bodies tend to have a younger looking skin than those who use hard water. Hard water is water that is alkaline usually due to the presence of excess calcium. By applying acidic (soft) ionized water to the skin it will help to clear up excess bacteria (reduce acne and other blemishes) and will work like an astringent to tighten up the skin and remove wrinkles. In Japanese hospitals acidic water is used to help sterilize wounds, treat diabetic ulcers and keep hospitals clear of infectious bacteria and viruses. Acidic ionized water can also be used to reduce inflammation and itchiness caused by insect bites. Pure water (non-ionized) ~ Why?Pure water can be important if you or visitors are on an acid-based drug regimen. Although alkaline micro clustered water helps the absorption of many supplements and reduces the dosage requirement, it may affect drugs designed to be taken with acid or neutral water. Integrated MICOM computer circuitry throughout ~ Why?This means CHOICE & SAFETY. Some water ionizers on the market try to make out that they are water ionizers but do not use computer controllers. This means that you are restricted by the pH of your incoming water and not able to adjust to the optimal pH for your own needs.Computer circuitry also allows hot water and low-pressure protection to be an automatic function. 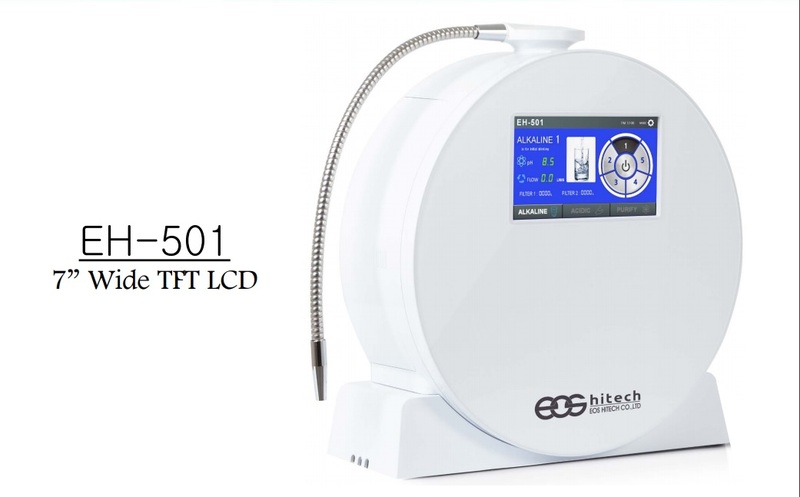 Liquid Crystal Display that changes color to match the ionized water’s pH selected, with low water flow indicator, plus hot water and low water flow alarms. Stainless steel output spout ~ Why?This may seem a small thing until you actually use an water ionizer without one. A top-mounted spout allows you to pour water anywhere; a real benefit when the sink is full of dishes, or when you want to fill a large bottle. Emco Tech has patented this very latest polymer ion separation technology. This technology helps to make AlkaViva water ionizers capable of the best range of pH and negative antioxidant ions of any system, making this water ionizer superior to any other brand of water ionizers on the market – REGARDLESS of water – ionizer & purifier / filter price. What is a Jupiter Melody JP104 water ionizer & filter? 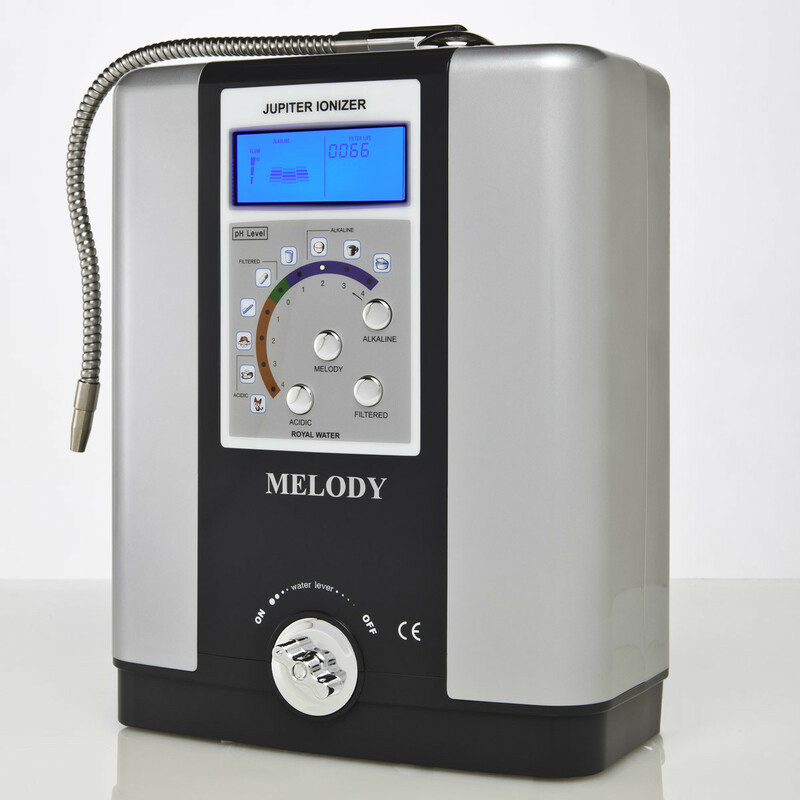 A Jupiter Melody JP104 water ionizer & filter is an electronic device that first filters water and then ionizes water through electrolysys (achieves the separation of water into alkaline and acidic streams, directly from your tap water, by a method of electrolysis ; water electrolysis or water ionization, is the method of producing a concentration of alkaline and acidic minerals – separating the oxygen and hydrogen found in water (H2O). The alkaline ionized water provides an antioxidant and electron rich medium for consumption, and the acidic ionized water provides oxidizing water that works like an antibacterial and cleanser for external use). How does AlkaViva Jupiter Melody JP 104 water ionizer & filter hook up to my tap water? The AlkaViva Jupiter Melody JP 104 water ionizer & filter sits neatly on your countertop near your sink, can be mounted on your wall, or can be put below the sink (with an optional water ionizer undersink kit). 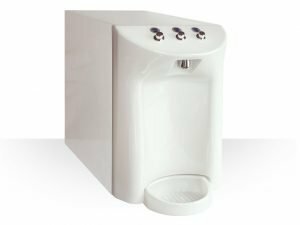 It hooks directly up to your faucet with a diverter valve that allows you to alternate between running water through the water ionizer or running water through your faucet. It is a flow-through water ionizer so your water is filtered and ionized instantly. There are no tanks to fill. The water travels through the water filters and then the water ionization chamber quickly, producing about 3 liters of fitered( and optionally ionized ) water per minute. The water ionizer also has to be plugged in, so you will want to make sure you have an electrical outlet near the water ionizer. Is a AlkaViva Jupiter Melody JP 104 water ionizer & filter difficult to install? 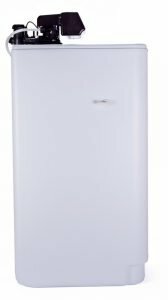 Can the AlkaViva Jupiter Melody JP 104 water ionizer & filter be installed under the sink? YES. The Melody JP-104 water ionizer & filter is one of the few water ionizers that can be installed under the sink with our optional water ionizer Undersink Conversion Kit With the water ionizer Undersink Conversion Kit, you’ll be able to put the AlkaViva Jupiter Melody JP 104 water ionizer & filter under your counter, while having a dual faucet on top of your sink, next to your main sink faucet. The only thing you have to make sure, is that you have an electrical outlet under your sink so you can plug in the water ionizer. Why is AlkaViva Jupiter Melody JP 104 water ionizer & filter the HIGHEST SOLD water ionizer in the WORLD ? When first version the AlkaViva Jupiter Melody JP 104 water ionizer & filter first began selling in US (before 1986), it was the THE PREMIER water ionizer. It was a powerful and had more functions that any other water ionizer before it. It was first water ionizer in the world to include AlkaViva’s patented MARC system, that keeps the Japanese platinum-titanium water ionization plates clean (NO scale buildup), thus maintaining high water ionization performance at a constant level over time and extending water ionization plates lifetime(over 20 years). This allowed AlkaVIva to be the first company in US to offer LIFETIME WARRANTY for its water ionizers and maintain LOWEST RETURN RATE and LOWEST FAILURE RATE in the industry of water ionizers. Besides being reliable and offering high water ionization performance constantly, it had /has a great range of Ph and ORP for ionized water , with an optimization for ionized water with the healthiest range of Ph as well as great water purification (currently includes FREE ULTRAWATER filter that removes 99.9 % of ALL known water contaminants) that made it the preffered model of choice of experts such as Dr. Robert O. Young , Dr. Ted Baroody , Sang Whang and of many health experts, health centres, hospitals, athletes and people form around the globe. It was proven in independent EPA laboratory testing to ionize water better than water ionizers such as Kangen Enagic SD501 or Tyent & other top water ionizers that competition offers that use more & bigger water ionization plates that require more power(so they are less durable water ionizers), it’s a more durable water ionizer (thanks to plate design & to the MARC electrode autocleanse system ) & thsi water ionizer & purifier/ filter has a LOWER price than other MLM water ionizers. ALL these at a LOW , DECENT water ionizer & filter price. It’s just a water ionizer that keeps going and going and going while maintaining high water ionization performance & quality, healthy water. Nowadays, newer AlkaViva water ionizers also include the patented MARC system . It is no wonder we have the LOWEST RETURN RATE and LOWEST FAILURE RATE in the industry and were the first to offer LIFETIME WARRANTY in US for our water ionizers. Four levels of alkaline ionized water ~ Why? Extra levels of pH means greater choice for you and other users. It also allows you to take advantage of higher alkaline ionized water pH levels when cooking which make greens greener, rice fluffier and coffee and tea more flavorful.Water ionizers usually have at least 3 levels of intensity to choose from. This is mainly because pure & alkaline ionized water is extremely detoxifying; people who have toxins built up in their system can suffer reactions such as headaches or diarrhea. This is especially true of the elderly because they often have built up many toxins in their bodies over the years. Also those who have a very poor diet(toxic , processed, refined foods , acidic – i.e. sugar, rafined cereals, “veggies” with pesticides, chemicals, animal products grown with hormones, injected ,etc- tipical diet) or have taken a lot of medications over the years. Having different levels of pH available simply allows people to build their tolerance for alkalien ionized water more slowly if they wish. Four levels of acid ionized water ~ Why?Enjoy the many ways you can use acid ionized water; for your skin, for your plants, for your home hygiene and more.The skin is naturally an acidic organ. People who regularly use acidic ionized water to wash their bodies tend to have a younger looking skin than those who use hard water. Hard water is water that is alkaline usually due to the presence of excess calcium. By applying acidic (soft) ionized water to the skin it will help to clear up excess bacteria (reduce acne and other blemishes) and will work like an astringent to tighten up the skin and remove wrinkles. In Japanese hospitals acidic ionized water is used to help sterilize wounds, treat diabetic ulcers and keep hospitals clear of infectious bacteria and viruses. Acidic ionized water can also be used to reduce inflammation and itchiness caused by insect bites. Pure water (non-ionized , filtered water ) ~ Why?Pure/filtered water can be important if you or visitors are on an acid-based drug regimen. Although alkaline ionized micro clustered water helps the absorption of many supplements and reduces the dosage requirement, it may affect drugs designed to be taken with acid or neutral water. 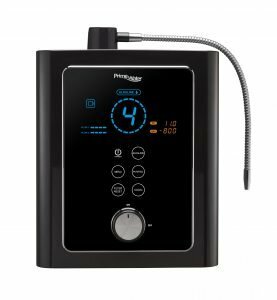 What levels of pH and ORP can I expect from the AlkaViva Jupiter Melody JP 104 water ionizer& filter? On average, the AlkaViva Jupiter Melody JP 104 water ionizer & filter will produce a 3.5pH and +600mV on the acidic ionized water, and a 10.5pH and -600mV on the alkaline ionized water and AlkaViva Jupiter Melody JP 104 water ionizer & filter will do the best job it can with the water that you are putting through it. Rest assured that almost every condition of tap water can be addressed beforehand, so that you can get the best output filtered /ionized water possible from your Melody JP104 water ionizer & filter. Why does the internet show different colors for the AlkaViva Jupiter Melody JP 104 water ionizer & filter? When the AlkaViva Jupiter Melody JP 104 water ionizer & filter first came out it was beige, with a sparkling blue center-stripe. 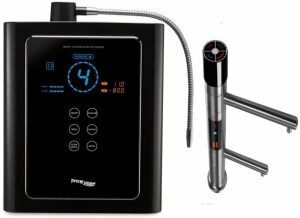 The LCD screen only lit up in one color (green) and the cleaning cycle would display a set of rotating lights after the AlkaViva Jupiter Melody JP 104 water ionizer & filter stop processing water. About 5 years ago, the AlkaViva Jupiter Melody JP 104 water ionizer & filter took on a new modern color that you see now (steel gray sides with a dark gray center-stripe) to match better the new “stainless steel” type kitchens. Also, the AlkaViva Jupiter Melody JP 104 water ionizer’s LCD now has three backlight colors; red for acidic ionized water, blue for alkaline ionized water, and green for “Purify Only” filtered water. The older AlkaViva Jupiter Melody JP 104 water ionizer’s LCD panel only lit up with a green backlight, no matter the setting. 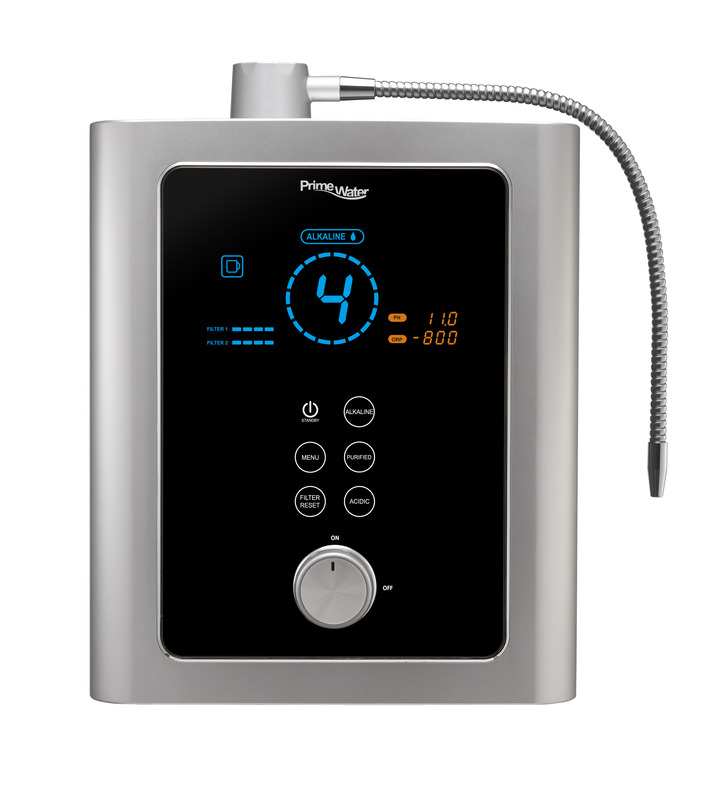 Also, the AlkaViva Jupiter Melody JP 104 water ionizer no longer shows rotating lights when it goes through a water ionization plates cleaning cycle.The new AlkaViva Jupiter Melody JP 104 water ionizer & filter also has a water flow “fine-tune” adjustment knob on the underside of the water ionizer . 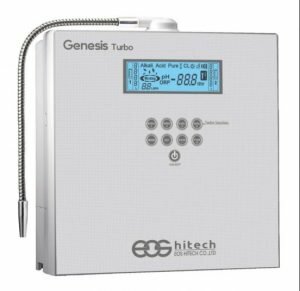 This allows you to fine tune the water flow rate of the main control knob on the front of the water ionizer. Is the “Isis” water ionizer the same with AlkaViva Jupiter Melody JP 104 water ionizer & filter? Isis is an older version of AlkaViva Jupiter Melody JP 104 water ionizer & filter. 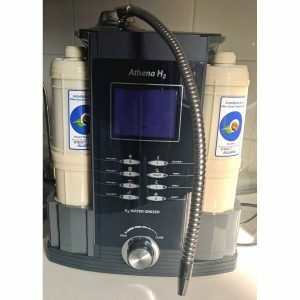 Since IonWays (now known as “AlkaViva”) became a multi-level marketing company, they changed the name of the AlkaViva Jupiter Melody JP 104 water ionizer & filter to the “Isis” to distinguish it from the AlkaViva Jupiter Melody JP 104 water ionizer & filter before, which was always sold as a regular retail product. AlkaViva has since went back to the old name of AlkaViva Jupiter Melody JP 104 water ionizer & filter because the name “AlkaViva Jupiter Melody JP 104 water ionizer” is what people were looking up on the internet to find and buy this water ionizer & filter. They realized that they should just keep the name that had been around for so many years. 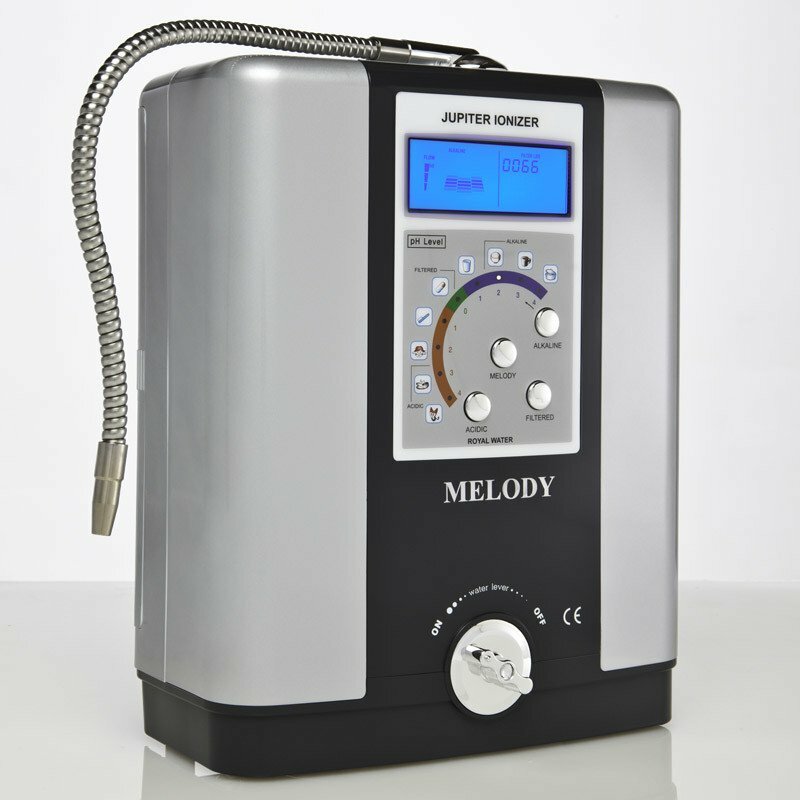 I am thinking about getting either the Melody JP 104 water ionizer & filter OR the Athena JS 205 water ionizer & filters. What’s the difference? The AlkaViva Jupiter Athena JS 205 water ionizer & filters is a dual-filter water ionizer. The AlkaViva Jupiter Melody JP 104 water ionizer has only one water filter. Also, and the bigger difference, has to do with the electrolysis system. 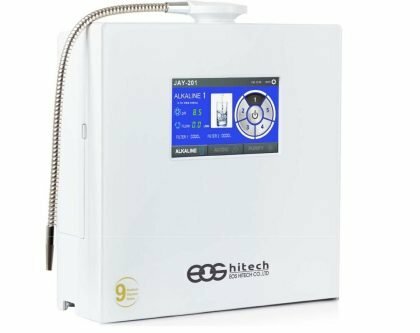 The Athena JS 205 water ionizer & filters has a more technologically advanced electrolysis system(MESH water ionization plates) than does the AlkaViva Jupiter Melody JP 104 water ionizer. The AlkaViva Jupiter Melody JP 104 water ionizer & filter has been around for many years, and is still the highest selling water ionizer WORLDWIDE.. but it has an older water ionization plates system which is not as advanced as the Athena JS 205 water ionizer’s The Athena JS 205 water ionizer’s plating system allows it to utilize the DARC system (DUBLE auto-reverse cleaning) which allows the electrolysis system to stay cleaner, longer. If your tap water is fairly clean and isn’t at all hard, then the AlkaViva Jupiter Melody JP 104 water ionizer & filter is an excellent alternative to the Athena JS 205 water ionizer & filters. 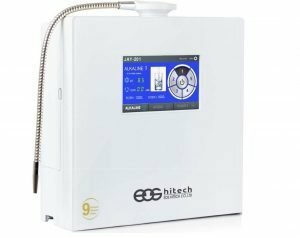 But, if you have higher than normal hardness then you will want to go with an Athena JS 205 water ionizer & filters since it has a much better capability of reducing any scale buildup on the water ionization plates system. Or, if you have a higher-than-usual contaminant load in your tap water, the Athena JS 205 water ionizer & filters can address those concerns better by having two water filters. Finally, rest easy that you have the best water ionizer & purifer / filter price and high quality from AlkaViva. If you’ve been shopping around, tell us what any other water ionizer has that this doesn’t. TELL US WHAT COMPETITION HAS TO OFFER WE HAVEN’T ALREADY DONE LONG TIME BEFORE! Buy with confidence. We are an authorized AlkaViva distributor and guarantee caring and professional customer service. We guarantee top value and service and no dishonest discounting on inflated water ionizer & purifiers /filters prices! 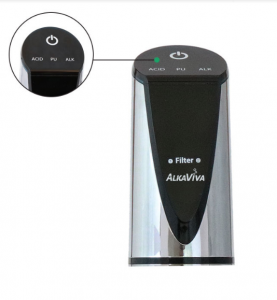 Why buy water ionizers, filters & accessories from AlkaViva?-click here! Partner companies with most experience, the most trusted and successful in the field of water ionizers & purifiers /filters in the world. Official Partner of AlkaViva : all the above advantages and the certainty that we will be present for customer support, water ionizer service, spare parts and water filter for the water ionizers & purifiers long after other companies have come and gone. Water ionizers & purifiers Buyer guide- see below!!! Benefits and unique properties of alkaline ionized water – live water molecular re – structured water, micro-clustered water , ”snowflake” hexagonal water, powerful detoxifying water, water with high pH, oxygen rich water, powerful antioxidant water – ORP, Virgin Water – EMF memory reset water – LONGEVITY water! alkaline ionized water reduces and combats the symptoms of many common diseases. alkaline ionized water increases energy levels. alkaline ionized water increases vitality – living water, and alkaline ionized water reduces biological age. alkaline ionized water cleanses and detoxifies the body (better than any detox program ) and protects against oxidative stress through -ORP antioxidant ( more potent than whole bottles of vitamin C ). ionized water, living LIVING WATER , deuterium depleted water distilled or reverse osmosis filtered water, tap water and spring water.